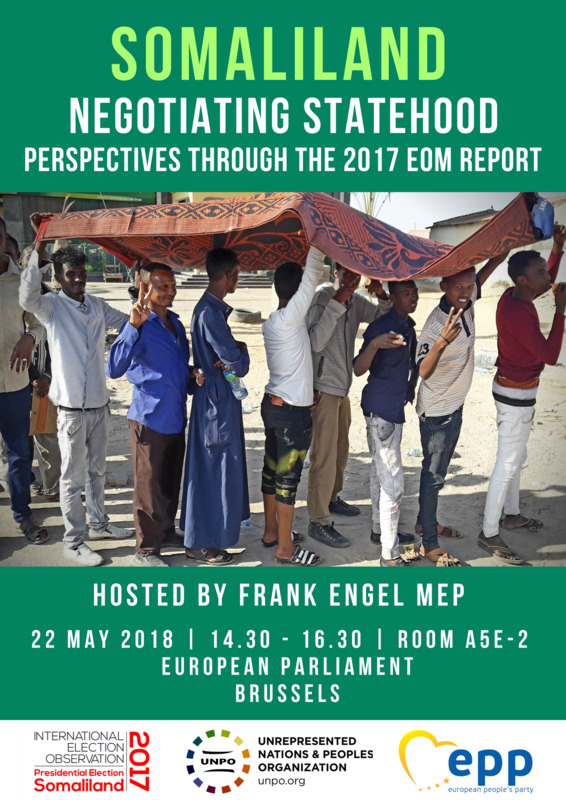 On 22 May 2018 the Unrepresented Nations and Peoples Organization (UNPO), in collaboration with MEP Frank Engel, will organize a conference entitled Somaliland - Negotiating Statehood, Perspectives through the 2017 EOM Report. This conference is the fruit of the recent democratic expression of the November 2017 Presidential elections, which saw the peaceful transition from outgoing President Ahmed Mohamed Mohamoud’s ‘Silanyo’ to the current President, Muse Bihi Abdi. Such a relatively calm example of representative democracy in a tumultuous and less stable Horn of Africa is impressive. A mission of 60 international election observers (EOM), partly funded by the British government and invited by Somaliland’s National Electoral Commission (NEC) was present before, during and after polling and observed campaigning, voting, counting, tallying and the publication of election results, which were immediately judged as showing once again Somaliland's democratic spirit. During this conference, representatives of the government of Somaliland will exchange perspectives with a number of speakers including the head of the 2017 International Election Observation Mission, Dr Michael Walls. In an effort to increase its international exposure and achieve its objective of independence and recognition, the Government of Somaliland has been a member of UNPO since 2004. Ever since Somaliland’s declaration of Independence in 1991, following a 9-year civil war with Somalia and the oppressive dictatorship of Somali ruler Siad Barre, the de facto independent Somaliland has conducted several democratic elections. Somaliland’s case for an internationally recognised sovereignty is justified in its large efforts to improve its representative democracy, as well as its increasingly progressive promises in regards to gender and human rights. Additionally, Somaliland currently fulfils all the criteria in the Montevideo convention on Statehood. Recognising Somaliland’s much desired sovereignty would permit the country to receive direct humanitarian aid for cases such as droughts and famine which have frequently hit this resilient nation, including in recent years. In light of this successful and emblematic demonstration of democracy and rule of law, Somaliland is more than ever eager to be taken seriously. Therefore, following the release of the EOM report in the UK, the Unrepresented Nations and Peoples Organization (UNPO) will convene a conference to present the report and raise awareness among European politicians, journalists and academics of the situation in this largely overlooked country in the Horn of Africa.